University of Illinois Springfield Chancellor Susan J. Koch was honored with the 11th Hour Award for Leadership by the University Professional and Continuing Education Association (UPCEA) on March 23 for her efforts to support students, faculty and staff during challenging budget times in Illinois. The award is given to an individual, team or unit in recognition of exemplary character, ethics, and decisive action in times of dire circumstances or emergencies. 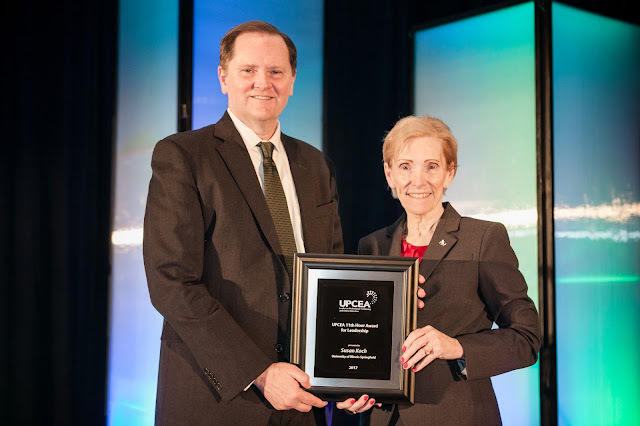 The award was presented during UPCEA’s annual conference in Chicago. Koch was nominated for the award by Vickie Cook, director of the UIS Center for Online Learning, Research and Service. “Chancellor Koch has led efforts to grow enrollments, fight for budget dollars, and support students by providing MAP (Monetary Assistance Program) grant dollars promised to students by the state of Illinois,” said Cook. In fiscal year 2016, UIS along with all of the other state universities in Illinois were dealt a nearly 70% cut in state funding; again this fiscal year, the university’s state appropriation has been cut by approximately 50%. “Massive budget cuts have dealt near-death blows to many state sister institutions, yet UIS’s enrollments were only three short of the record for the university, and programs at UIS continue to thrive under Chancellor Koch’s exemplary leadership,” said Robert Hansen, Ph.D., chief executive officer of UPCEA. In order to grow and maintain enrollment, Chancellor Koch has supported initiatives for a transfer and international student marketing campaign targeting online students. Online students make up about one third of the total UIS enrollment. “Chancellor Koch is a tremendous student advocate and in the face of the unknown on the Illinois state budget talks, she continues to show perseverance and willingness to encourage innovation at the University of Illinois Springfield,” said Cook.